Mark Macekura, from the election board feeds a paper ballet into a new scanner. 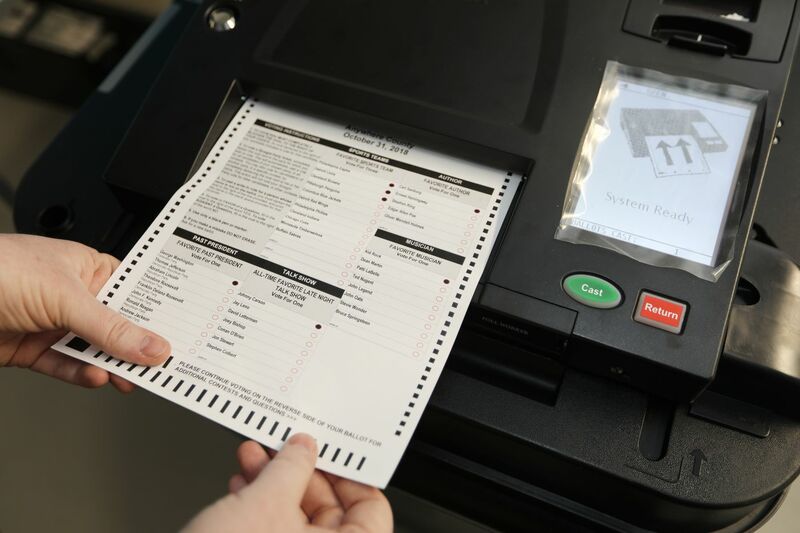 Montgomery County has received new voting machines it will begin using in the primary this May, Tuesday February 26, 2019. Imagine getting up early on election day having done your homework on the issues, educated yourself on candidates’ positions, and chosen whom to vote for, only to find poll workers who do not know how to turn on, set up, or assist you in using the voting machine. That is exactly the type of story we at Disability Rights Pennsylvania heard, along with a host of others, during the last presidential election in 2016 when we ran a hotline for disabled voters. During the 2016 election, less than 20 percent of polling places were accessible to people with disabilities. Some voting systems rarely had instructions included, others lacked tactile buttons for people with low vision, and for some systems, the voters could not verify that the ballot reflected their choices. For these reasons, voter turnout for people with disabilities remains under 50 percent. According to the American Association of People With Disabilities, 16 million of the eligible 35 million voters with disabilities cast a ballot in the 2016 election. With election security on the minds of legislators, there is fear that changes to polling technology will only further disenfranchise citizens with disabilities in the coming election. Pennsylvania Bills S.B. 411-419 have been introduced in the House and Senate to update and reform the election system. This comes as counties and the disabled across the state test new voting systems that create a paper trail through different formats. Last April, then-acting Secretary of State Robert Torres instructed Pennsylvania counties to have a paper-verifiable voting system by 2020 and allotted $14 million for the process. Many have taken official action toward acquiring new voting systems, either through a vote to purchase or lease a system, or a vote to approve funding. Torres also instructed counties to have selected the new voting system no later than Dec. 31, 2019. Some counties have chosen or are considering hand-marked paper ballots. It has always been important that these types of changes not leave people with disabilities behind. Hand-marked paper ballots make it nearly impossible for those with visual disabilities to vote using this system. At such polling stations, alternatives for disabled voters at each polling place would be separate from the system used for non-disabled voters. Other proposals would further single out disabled voters, such as the idea to explicitly separate out accessible voting processes out of a desire to return to hand-marked ballots or punch cards. This creates a system whereby disabled votes would be tallied apart from those who didn’t use the system. But as always, separate is not equal — and security does not need to come at the cost of accessibility. The shared goal should be voting reforms and systems that are modern, safe, secure, and always accessible to each voter. The law requires that people with disabilities be able to mark, verify, and cast a ballot privately and independently as do their fellow Pennsylvanians. Protecting these rights comes down to each system’s details. Of course, with any proposed legislation, it is these particularities upon which stumbles are made. For example, there is currently no provision that requires an electronic ballot delivery system be available to absentee voters with disabilities. This has the potential to leave behind those with dexterity issues, low visibility or blindness, learning difficulties, and more. All of these measures represent an important first step to election reform that hasn’t happened in decades. But more work needs to be done to ensure that people with disabilities can vote privately and independently, and verify their vote. Casting a ballot shouldn’t be an added exercise in disability discrimination. Proven election reforms such as the implementation of electronic poll books, voting by mail using a no-excuse absentee ballot, preregistration for youth, and more have been tried and tested in other states, garnering support from Republicans and Democrats alike. If the General Assembly finally wants to take up election reform, then it should take up the challenge of not just updating voting systems but making it more accessible to vote by mail and instituting early voting. With 35 million eligible voters with disabilities across this country set to use their ballot as their voice in the coming election, the inability to address the access needs of disabled voters feels to many intentional and remains a symbol of who in this country counts, and who does not. As important as it is to make sure every vote is securely counted, it is equally important to ensure that voters have a voice — especially voters with disabilities who have been disenfranchised for far too long. Imani Barbarin is director of communications and outreach at Disability Rights Pennsylvania, where Gabe Labella is a staff attorney and project director of protection and advocacy for voting access.